The Otter Lodge on Monroe Avenue in Brighton is a good place to watch a ballgame. In 2015 we cheered former Brighton Baron Ernie Clement to victory in the College World Series. In 2015, we watched the Wisconsin Badgers and Frank the Tank lose in the NCAA basketball finals. 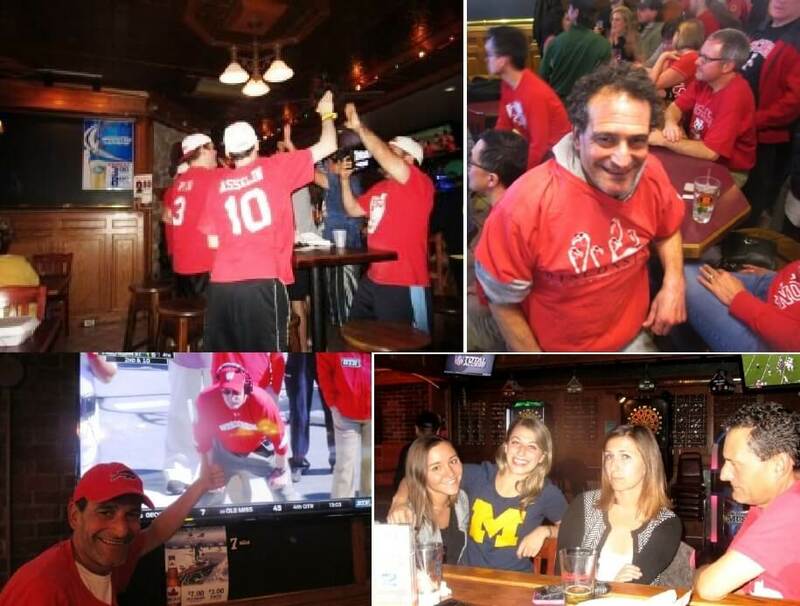 In 2016, the Wisconsin alumni association came back to the Otter to celebrate several big wins in the Big Ten and cry in our beers after defeat to Michigan. In 2017, we watched Buffalo lose its first playoff game after a 17 year drought. (upper left) from Brighton fans celebrate hometown hero Ernie Clement in victory ; (upper right) from Rooting for the Rams and remembering St. Patrick’s Day, 1989 ; (lower right) from What Maritza Buitrago can and cannot say on the electoral road. (upper left) from No Jills; no playoffs for the Bills ; (upper right) from The Jills ball as talisman thwarted; the curse is back. 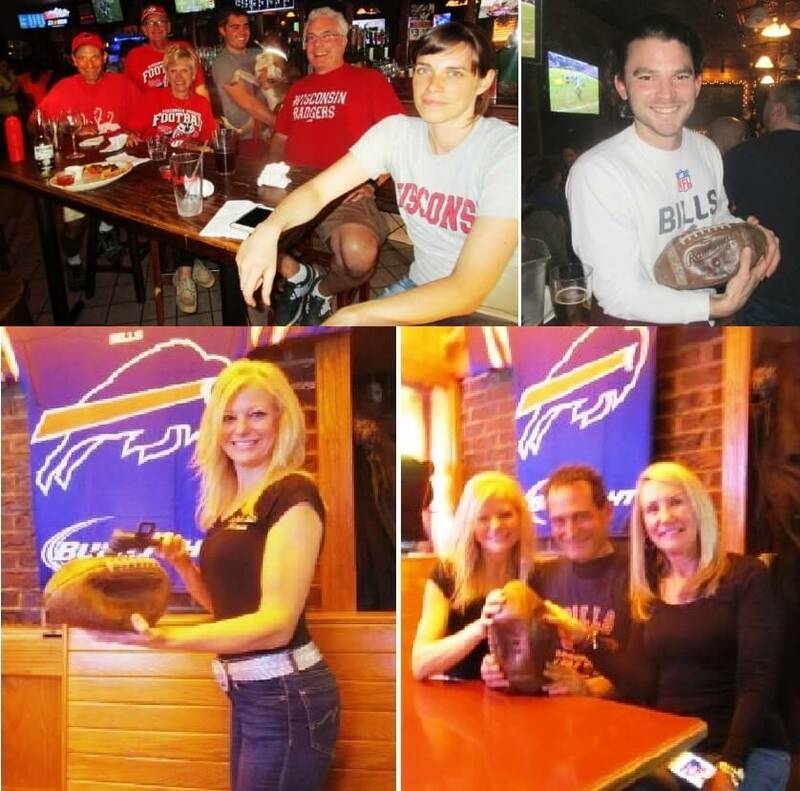 ; (lower right) from Despite the lifting of the curse, Peterman and the Jill-less Bills drop the ball. One memorable evening, I watched a Giants-Redskins Monday night game sitting next to a professional gambler. The gambler lived in Las Vegas, but was visiting family in Rochester. He had placed a couple of grand on the game. The man explained his strategies: never bet with your emotions and carefully hone and master just a few key statistics like player age, weather, and assistant coaching experience. Apparently, the man hated his chosen career path, even though he was one of only a dozen or so men — all men — who made a decent living placing wagers at Nevada sports betting casinos. But he tired of watching sixteen games on sixteen tvs every day while the casino mangers eyed him suspiciously. His lifestyle cost him his marriage and strained his relationships with his children who still lived in Rochester. The gambler’s goal was to build and retire to a log cabin in the Adirondacks, live completely off the grid and never even buy another lottery ticket. Late in the fourth quarter, he glanced at the TV for the first time in half an hour. The Giants had recovered a fumble, were running out the clock and would cover the over-under on which the man had bet. With as much enthusiasm as watching a tired game show come to an end, he said nonchalantly, well I won my two grand, finished his beer, wished me well and left. 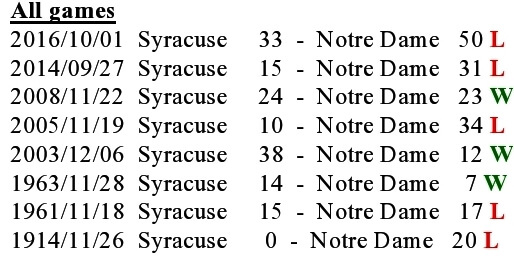 The 8 previous Syracuse – Notre Dame games. After Saturday’s win, Notre Dame leads the Shamrock Series 6 – 3. 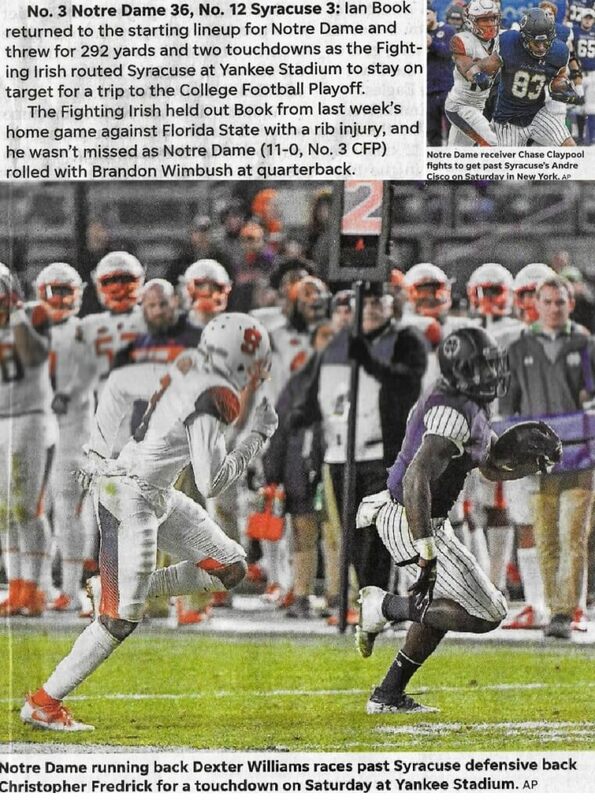 If you were a Syracuse fan — unless you placed two grand on Notre Dame to cover the spread — yesterday was not a good afternoon to be at the Otter. This was the 9th meeting of what is now called the Shamrock Series because the Irish are clad in green while the Orange wear Orange. 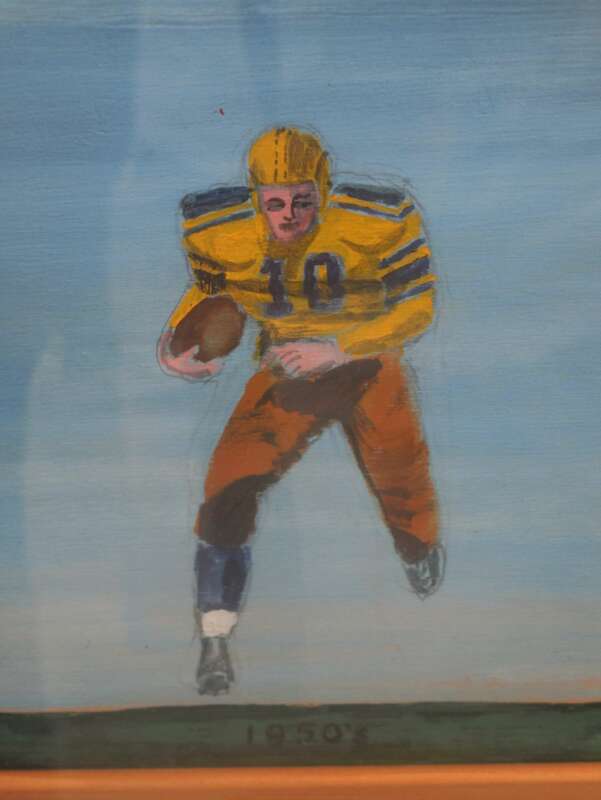 The teams split the first two games in 1914 and 1961. 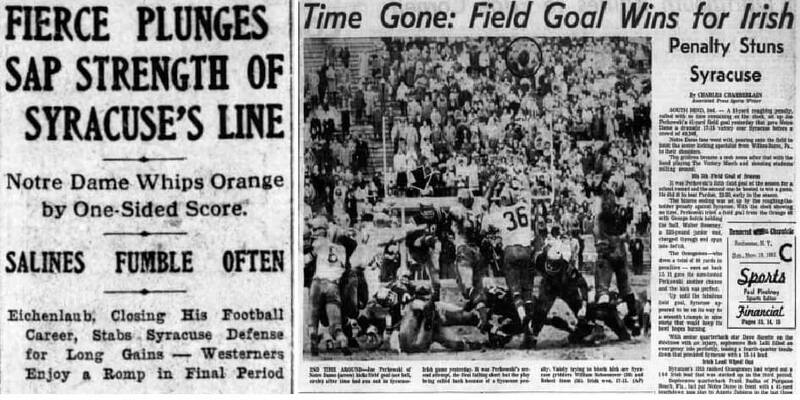 In 1961, According to Syracuse.com in Notre Dame’s ‘tarnished victory’ , after missing the first field goal attempt as time expired, Notre Dame was awarded another play on a rougher the kicker penalty — probably wrongly although the rule enforced was murky — and then made the game winning kick. Notre Dame’s President later offered to forfeit the game but Syracuse chose no to accept. 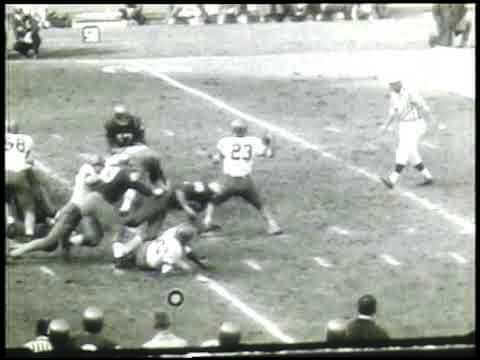 Scholastic Football Review 1961: Football Game Scene – ND vs. Syracuse, 1961/11/18. 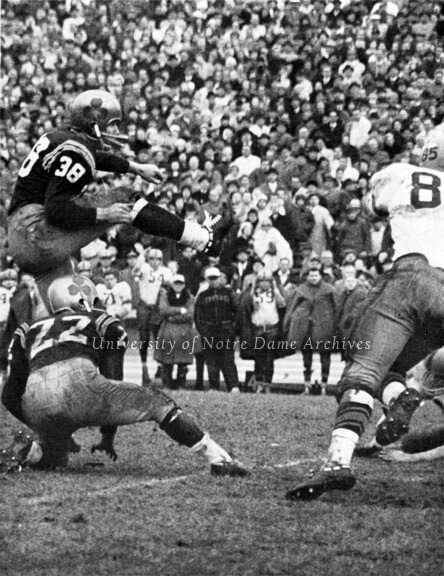 Kicker Joe Perkowski (#38) kicking a second attempt field goal and George Sefcik (#22) holding the ball with no time left on the clock. Time ran out on the first kick in which Syracuse defense committed a penalty by roughing the kicker. Perkowski made the 41-yard field goal to win the game 17-15. 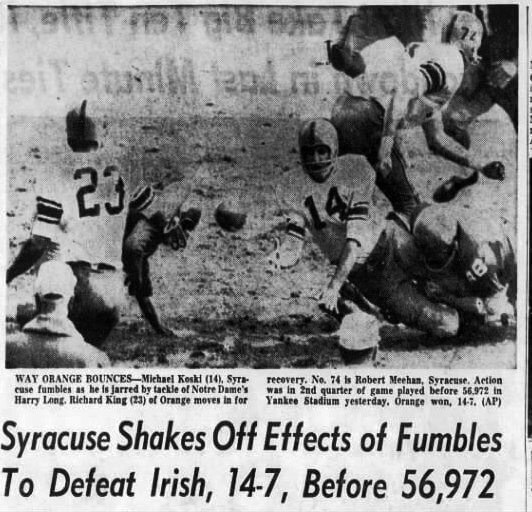 The third game in November 1963 — the first time before yesterday the Irish and the Orange had met at Yankee Stadium — was the most historically dramatic. Only six days before, President Kennedy was killed in Dallas. Notre Dame had already lost one game due to the tragedy. 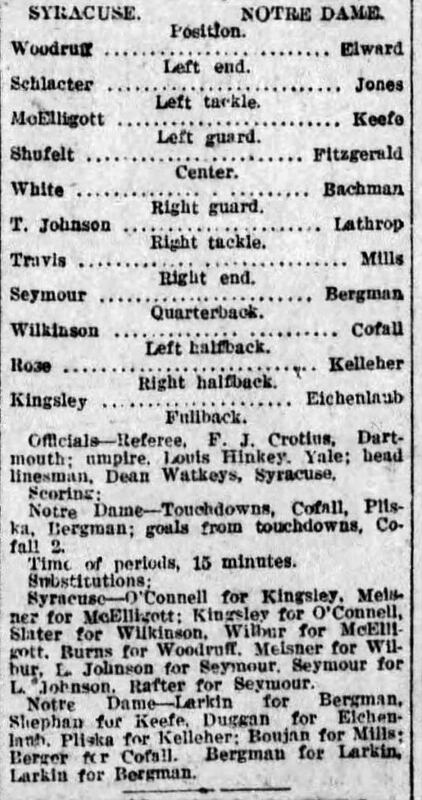 The day after the assassination, its scheduled game against Iowa was cancelled and never replayed. Although spirits were low, the game at Yankee Stadium had to be played. A huge crowd of almost 57,000 attended — then the Stadium’s capacity, including standing room only, was close to 80,000 — where seven weeks before the Dodger’s Sandy Koufax beat the Yankee’s Whitey Ford en route to a World Series sweep. The fans were fairly evenly split between Syracuse and Notre Dame. Although the score was close, the Orange were the stronger team. 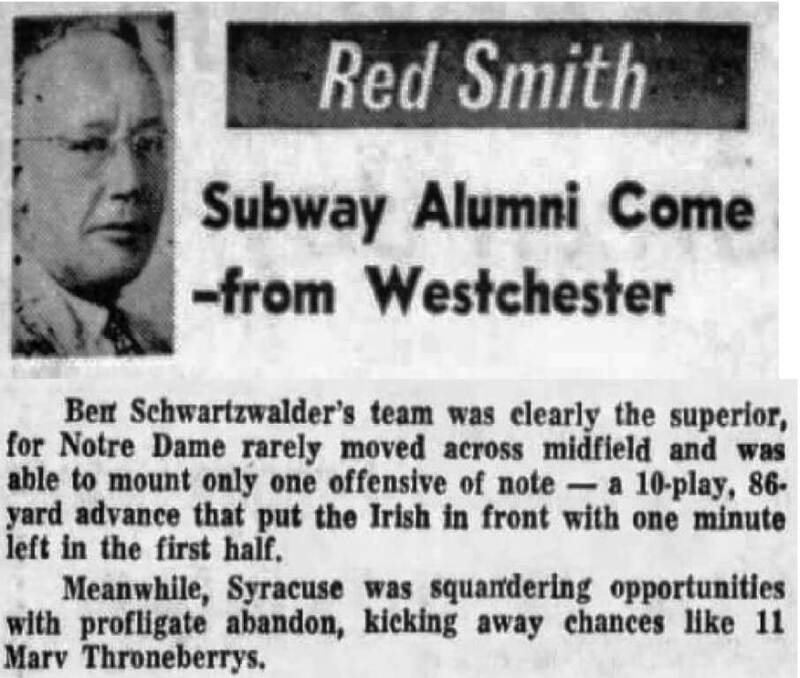 The Rochester Democrat and Chronicle ran Red Smith’s column from The New York Times,“Subway Alumni Come — from Westchester,” about Syracuse alum from the New York metropolitan area who flocked to the game. In Smith’s characteristically colorful — if not purple — metaphor, Red refers to first baseman Marv Thronberry who in 1962 made 17 errors in only 97 games for the last place New York Mets. 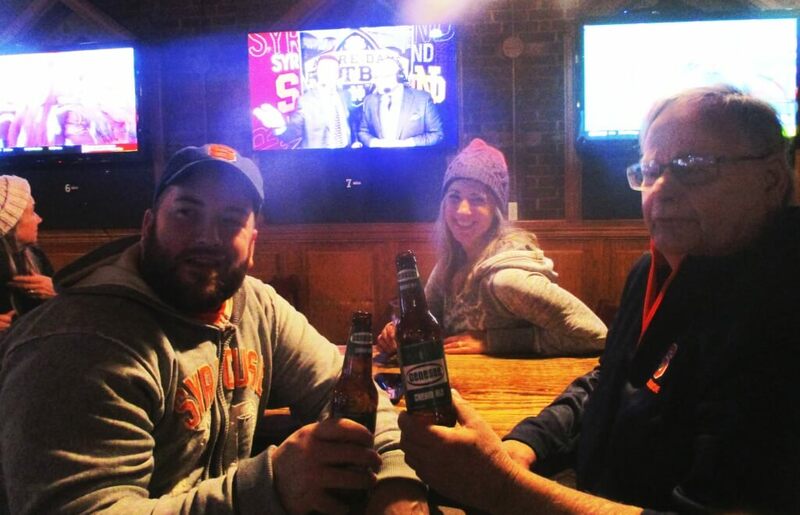 Yesterday, six diehard Syracuse fans gathered at the Otter for the Yankee Stadium redux. (l) Tim; (c) Jo Anne; (r) Al. 11/17/18 at the Otter. 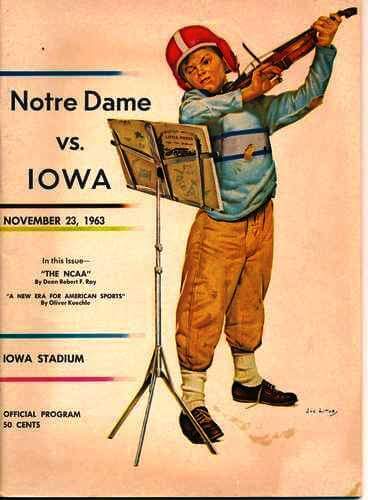 At that time, the score was 13-0 Notre Dame. Syracuse basketball games draw good crowds at the Otter; Tim watched in 2003 when Carmelo Anthony led the ‘Cuse to the NCCA championship. Syracuse football fans, however, are unused to the team’s recent successes and the fan base is smaller than for basketball. On nearby Oxford Street, an Orange fan displayed his banner. As the game progressed and Notre Dame’s lead widened, Mr. Orange seemed to fade away.